While most teens he knew were concerned with prom, athletics and preparing for the future, Brian was getting ready to be a dad. At the age of 17, he dropped out of high school and moved in with his girlfriend, eventually wife, to care for their first of four children. For more than 20 years, Brian and his wife worked hard to make ends meet and provide for their family. Although life was challenging at times, Brian still describes the birth of his children to be the best thing that has ever happened to him. A nail pierced Brian’s right eye on a job site when he was just 36 years old. Consequently, he became blind and unable to work for over 2 years. In addition to the stress from his injury, Brian’s wife, who had a lifelong battle with diabetes, passed away. The dark times that followed were some of the hardest of Brian’s life. After enduring multiple repairment surgeries and the loss of his wife, Brian became addicted to the pain medication he was prescribed for his injury. As he dove deeper into his addiction, his girlfriend introduced him to heroin. His situation began to spiral out of control. Every night, Brian and his girlfriend would search for a place to sleep: cars, abandoned houses, alleys, cellars if someone would let them. They’d wake up, get food at The Mission, walk, eat from trash cans, use drugs. Day after day. Night after night. Finally, after a fight with his girlfriend and realizing that she didn’t want to get well, Brian found himself at the Kirkbride Center. Soon after, Brian transferred to House of Healing in Point Breeze where he met fellow resident, Chris. “He was very kind to me. If I needed anything, he got me.” It was Chris who brought Brian to Back on My Feet. After his first run with Team Point Breeze, Brian felt great. A part of something. Running with the Back on My Feet became the best part of his day. “It is amazing how it changed me. I didn’t see a future for me. You get in your head and beat yourself up. 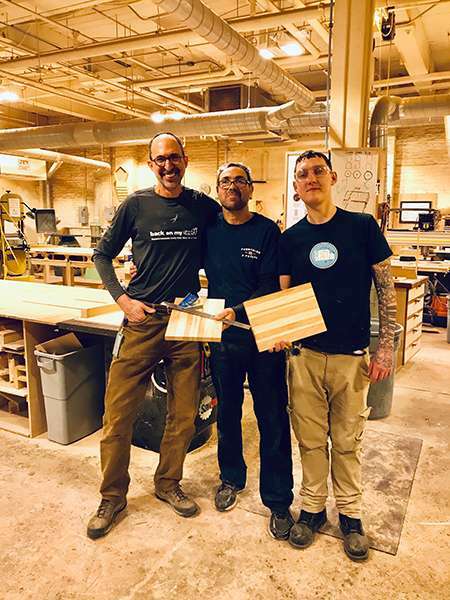 After Back on My Feet, doors started opening.” The hugs and the positivity offered by the Back on My Feet community helped Brian break a vicious cycle, find hope and ultimately a career. Now, Brian is now working towards his GED (taking his first pre-test next week!). With Back on My Feet’s help, he is also enrolled in Furnishing a Future, a 6-week long job training program teaching carpentry skills. Brian reports that there are already employers looking for graduates of the program, which he finishes soon. The work at Furnishing a Future gives Brian joy. He shared “When I’m there, the day passes like magic.” He can’t wait to find employment that leads to a career and credits that to being a part of Back on My Feet. Be a part of the community that transforms so many lives, like Brian’s by making a donation, becoming a volunteer, or getting involved with your local Back on My Feet chapter.